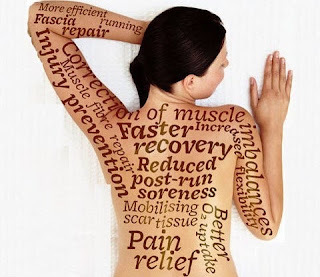 Sports massage is a massage modality used to treat athletes of all kinds at any level of fitness. Whether you are a professional athlete, weekend hiker or fitness enthusiast, a sports massage can benefit immensely. A massage therapist will use her knowledge to tailor a treatment plan specifically for you, to help your body tap into its natural healing performance potential. A Sports massage therapist will design a massage specific to the athlete and focus on those muscles that are overused and overstressed by sports related activity. This is beneficial both pre and post event for athletes who compete. Pre-workout sports massage promotes flexibility, endurance and overall performance. Regular pre-workout massages can greatly decrease the chance of injury by increasing the range of motion and the elasticity of muscles and tendons. Post-workout sports massage helps to relax the muscles, reduce soreness and speed up recovery time. Sports massage can be ideal to treat injuries. Conditions such as minor muscle strains, shin splints and plantar faciitis can improve. More severe injuries, depending on their stage in the healing process, will depend on the diagnosis and recommendations of your physician. Your massage therapist will be happy to discuss this with you. Aside from receiving a sports massage, the best way to take care of your body when performing is warm up. Any activity that gets your heart rate up and warms the muscles can improve performance during an event. Warming the muscles makes them more pliable and less likely to tear. It's important to remember that warming up is different from wearing out. You want to make sure your muscles are warm and ready to perform, within reason since you are more prone to injury when the body is fatigued. If you would like to lean more, please visit our website, www.absolutebodybalance.com or call the office to schedule a sports massage, 919-841-9344. Absolute Body Balance's massage therapists are happy to assist you with adding sports massage to your workout regimen. First one hour massage is only $55 for new clients!